Can millennials have it all? The generation born in the 80s gets a tough rap. They are often dismissed as a generation of folks who were overprogrammed, over-coddled kids that demand trophies for last place and immediate gratification. Those kids are now adults in their thirties and we’re wondering what kind of adults have been produced from a childhood in the fast lane. Daigle & Travers looks to one of their newest hires, Tom Velazquez, for the answers. Tom Velazquez joined Daigle & Travers Insurance Agency in 2018 as a Commercial Lines Account Executive. He was first introduced to the insurance world through a high school internship. He came back to it getting licensed in Life & Health Insurance and Property & Casualty Insurance after getting his Bachelor of Science in Business and Technology from UConn. If you’re picturing Ned Ryerson (from the movie Groundhog Day), you will be happily mistaken. On first meeting, you’ll see someone dressed to the nines with a gregarious smile and hearty laugh that fills every corner of the room with warmth. First impressions set the bar high and Tom does not disappoint – behind the charm is a man who is dedicated to charity and volunteerism. Tom is a former triathlete who traveled to Spain to hone is his skills. When he returned to the states, he shared his skills while mentoring a half-marathon running group of new to moderate runners in Stamford. His dedication to helping others doesn’t stop with his two-footed neighbors; his lifelong love of animals led him to volunteer at the Stamford Animal Shelter. 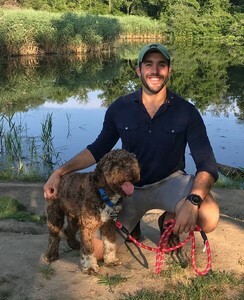 And of course, because millennials are inclined to be equally engaged in athletics, humanities and arts, Tom also serves on the board of the Stamford Symphony. He was recruited by their CEO to advocate for Symphony on Tap, a program that engages the under 40 crowd to connect with classical music and their peers. In fact, they have an event this Wednesday, December 5th, which still has tickets available here . Are you intimidated? Well, one last thing we should share, will make you want Tom as a best friend. He has a soft spot and its for doughnuts. He loves them so much that he takes selfies with doughnuts wherever he travels. You’re definitely going to want to follow his Instagram page @TheTravellingDonut . In 2018, Velazquez met Bonnie Piazza (an executive at Daigle & Travers) at a focus group and they became fast friends. When Tom relocated from Greenwich to Norwalk later that year, he took the opportunity to bring his talents to a new agency, joining Bonnie at D&T. The Darien based agency loves having an energetic and driven millennial in their midst. Tom came back to insurance after college because he loved helping people and building relationships. Fourteen years later he says, “People think of insurance as a boring industry, but when you give it a second look there’s more to it than policies and premium payments. Cultivating relationships with clients to help them manage everyday risks is a gratifying experience.”. Tom Velazquez is a part of the Daigle & Travers team of Fairfield County, a group of insurance experts offering 35 years of expertise and extensive knowledge of personal and business insurance programs. For more information, you can visit daigletravers.com or call Tom at 203-655-6974.